William Tricker was born Charles William Brett Tricker in England in 1853. He was the son of Charles Tricker, a gardener. The family lived in Bishop Hortford, Hertford, Herts, just northeast of London. April 17, 1876, at age 23, he married the hometown girl Elizabeth Hewitt, aged 20. 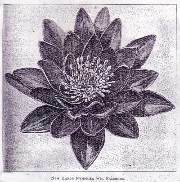 In the winter of 1893-94 a European house sent Tricker seeds purported to be Victoria regia (today V. amazonica). Some of those that germinated had light green leaves that made relatively high rims at an early age. 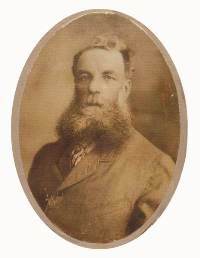 William Tricker "provisionally" distinguished this different Victoria as 'Tricker's variety'. Further investigation by Tricker and Henry S. Conard revealed that the stock came from Corrientes, Argentina, and was V. cruziana. That this new type tolerated cooler temperatures than V. amazonica created even more interest in growing Victoria and other aquatics. Tricker published his classic book, The Water Garden, in 1897. 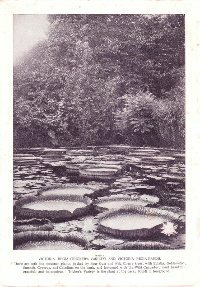 In it he described Nymphaea pulcherrima, later known as N. 'Blue Beauty', as a "Garden hybrid of American origin". The description indicates that this perhaps best known Tricker hybrid was a chance seedling of N. caerulea rather than the result a purposeful cross. 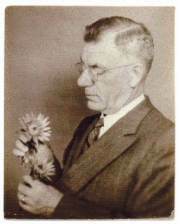 He sold his business to Henry A. Dreer Nurseries in Riverton, New Jersey, in 1897, and went to work for Dreer's until 1905 or 1906, managing the aquatics department. During this time Dreer's introduced the hardy cultivars N. 'James Gurney', N. 'Wm. Falconer' and N. 'Wm. Doogue' (1900). In 1901, it introduced N. 'James Brydon'. Though N. 'James Gurney' was only offered for one year, reason for the withdrawal unknown, the other three cultivars were very well received. Tricker was not credited with creating these cultivars but it is likely he did so. 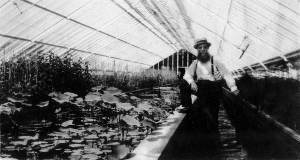 In 1906 Tricker again established his own aquatic nursery business in Arlington, New Jersey. William Tricker, Inc., issued its first catalog in 1912. Tricker and his wife had six children who reached adulthood and two who were still-born. Tricker died in 1916 and was buried in Arlington. His youngest son Charles was born April 6, 1890, and would be the member of the next generation to carry on the business. In 1927, Charles Tricker purchased 16 acres in Saddle River, New Jersey, selling the increasingly valuable property in urban Arlington. 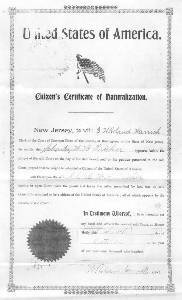 He purchased the new property, in an agricultural area in northern New Jersey, from the Packer family, owners of the town mill. Two greenhouses from Arlington were dismantled and reconstructed as the back greenhouse of what was then William Tricker, Inc. and is today Waterford Gardens. In 1928 and 1929, as finances permitted, the main greenhouse was added. Over the next few years local rail service, necessary for transporting fish (in milk cans), declined. About 1930, Charles purchased another water garden nursery in Independence, Ohio, which had better rail facilities. one of the two later moved to Saddle River. 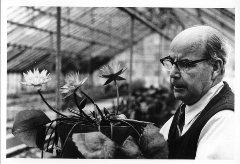 The Independence nursery had been founded by Albert Buskirk and later run by noted aquarist and chemist William G. O'Brien (1889-1928). Bill Schmidlin, born September 24, 1907, worked for Buskirk during the summers when he was in high school. When he graduated in 1926, he became a full time greenhouse employee. Charles Tricker discovered him and made an arrangement with Bill's mother, widowed with six children to care for, to send Bill to Saddle River to run the greenhouses, with the proviso that half of his salary was sent directly to her. Bill slept in a room off the salesroom of the nursery and took his meals at a boarding house which is now the police station. Bill met Ruth Tricker in her father's greenhouses and they later married. Schmidlin effectively became manager of the Saddle River nursery, while Charles Tricker devoted much of his attention to other local business interests. When Tricker died in 1961, Schmidlin bought out the existing stockholders and became the sole owner of both the Saddle River and Independence facilities/businesses. In 1986 Schmidlin sold the business name and Independence location to Richard Lee. The year before, he had sold the Saddle River business to prominent New Jersey landscape architect John Meeks, who renamed it Waterford Gardens. Meeks asked Schmidlin to stay on as chief propagator, a position he held for about 10 years. He retired when he was in his mid-80s and his health no longer permitted long hours and the heat of the greenhouses. Bill Schmidlin died May 28, 2001. Ruth Tricker Schmidlin, at age 93, lives independently, drives herself to shops, church and to play bridge. She has been a treasured resource for this article. * A copy of this 1892 catalog can be found in Cornell University's Mann Library. Lawrie, James. Conversations with Ruth Tricker Schmidlin December 2005 through April 2006. Mastrantonio, Louise. Personal correspondence, July 2007. Moon, Mary H. Plantsmen in Profile, III: Charles Tricker. Baileya 5, pp. 133 - 136, 1957. Pagels, Walter. 'Mrs. Robert Sawyer' or 'Independence'? Slocum, Perry D. & Robinson, Peter with Perry, Frances. Water Gardening, Water Lilies and Lotuses. Timber Press, Inc., Portland, OR, 1996. Tricker, William. The Water Garden. A.T. La Mare Printing and Publishing Co., Ltd., New York, 1897. Tricker, William. "Origin of Hybrid Nymphaeas". The Garden, February 23, 1901, p.139. William Tricker, Inc. Catalog, 2006.